Complete control of contract material and miscellaneous items such as workshop consumables, non-steel items and stationary with inventory levels tracked as inventory module makes automatic adjustment made for purchase orders received, issued and consumed. Self-maintaining with no manual adjustment is necessary. 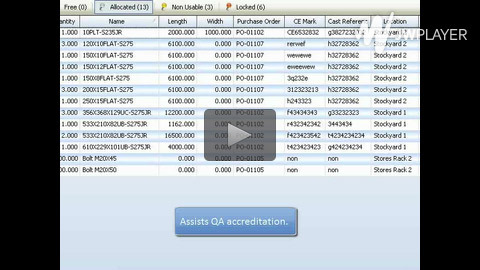 - critical when complying with QA standards for traceability and control and ensures maximum material utilisation. Sale of free inventory, goods may be "sold" via a direct interaction with the sales invoicing module, goods will be added to a sales invoice, picking slip and delivery note. inventory value displayed as an item cost, unit price per metre, tonne. Numerous management reports e.g. Inventory valuations/status, historical usage by type or supplier and location inventory are available at the touch of a button. "We chose STRUMIS for its tailor made capabilities for managing our material effectively whereby its optimisation helps us reduce cost, saving material with help of reducing scrap and similar in timely completion of our projects by preventing last minute procurement requirements."